DC Health Link offers quality, affordable health insurance to residents of the District of Columbia, small businesses located in the District of Columbia, and their employees. We have a team of trained experts who speak your language, and are ready to help you find health insurance that meets your needs and budget. Can I get Help Paying for Coverage? There are a couple of programs available to help pay for health coverage if you qualify. You must apply for financial assistance to get an official determination of eligibility. Medicaid - If your income is low enough, and you meet certain other requirements, you may qualify for free or low cost Medicaid coverage. It’s possible for some people in your household to qualify for Medicaid, such as children, while others do not. You can apply for Medicaid coverage any time during the year. 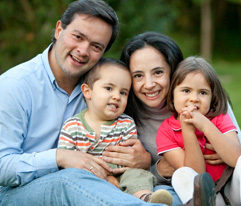 Financial Assistance - If you do not qualify for Medicaid, but if your income is low enough, and you meet certain other requirements, you may qualify for tax credits to help you buy a private insurance plan and/or for cost-sharing reductions that lower your out-of-pocket costs if you choose a Silver plan. Yes. If you, or someone you’re helping, has questions about DC Health Link, you have the right to get help and information in English at no cost. To speak with an interpreter, call (855) 532-5465. Please stay on the line and wait for a message in English that will tell you which button to press on your phone for assistance in your language. (855) 532-5465 / TTY: 711 Call us and wait for the prompt in your language. Small business owners know that their ability to offer employees high-quality health insurance is a competitive advantage in the labor market. DC Health Link serves small businesses with 1-50 employees. If your business is located in the District of Columbia, and has at least one full-time equivalent employee (not including owners, partners or family members), you can create a health benefits program at DC Health Link. If you are self-employed with no employees, you may be eligible for Individual & Family health insurance. DC Health Link offers over 100 health insurance plans from all the major health insurance companies that service the District of Columbia. All plans at a minimum, include essential health benefits required by US government laws, as well as certain preventive services. Because all insurance companies must post their prices and benefits, the quality of plans and pricing available through DC Health Link is highly competitive. DC Health Link also offers a wide selection of dental insurance plans for small businesses. DC Health Link lets you decide how much to contribute towards the monthly premium costs for health insurance for your employees and their dependents. You must contribute at least 50 percent of the costs for each eligible employee. You can offer health insurance to family members too, and it’s your decision whether or not to contribute towards their monthly premiums. If you cannot afford to contribute at least 50 percent for each employee in the lowest cost plan you offer, you can sign up during the special annual enrollment period and make either a smaller contribution towards the costs or no contribution. Health insurance premium costs are based on the age of each person covered. When can my business sign up? Small businesses can create a health benefits program at DC Health Link anytime during the year, and will renew their plans at the same time next year. How do employees sign up for health insurance? If your employer offers a health benefits program through DC Health Link, your employer will tell you when and how to sign up. Ask your employer. If your employer does not offer health insurance through DC Health Link, you may be eligible to purchase Individual & Family health insurance. Can my business get help paying for health insurance? Small businesses with less than 25 full time equivalent employees may be able to reduce their costs by qualifying for US government tax credits. The tax credit will cover up to 50 percent of an employer’s contribution (or up to 35 percent for a non-profit organization). To be eligible, your business must: have less than 25 full time equivalent employees; have average employee wages of less than $50,000 a year; purchase health insurance through DC Health Link; and pay at least 50% of the cost of coverage for each eligible employee. Can I get help from a translator or expert? Yes. If you have questions about DC Health Link, you have the right to get help and information in English at no cost to you. To speak with an interpreter, call (855) 532-5465. Please stay on the line and wait for a message in English that will tell you which button to press on your phone for assistance in your language. The interpreter can also help you connect with an expert insurance Broker, who at no cost to you, can help you set up your health benefits program and choose the plans that best fit your needs and budget. Brokers are also available to help your employees at no cost.